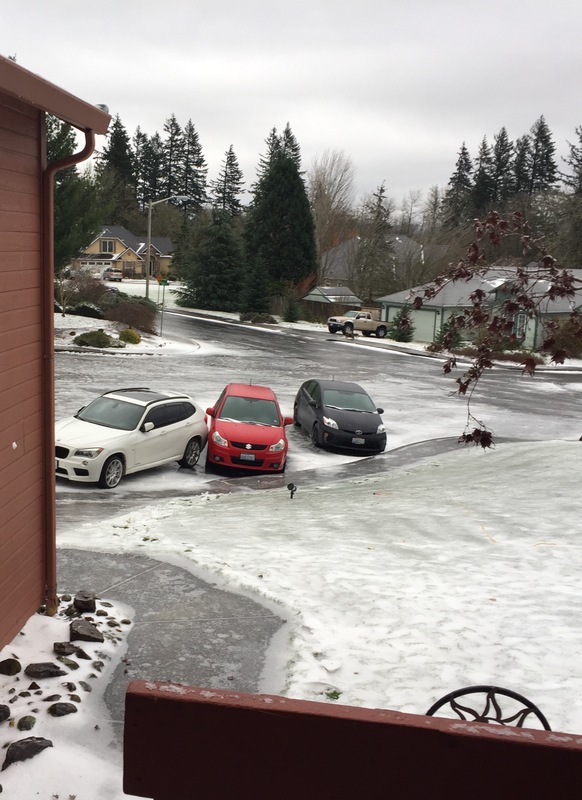 On the west coast, we aren’t very good at the whole ‘snow’ thing. We like it, but if you’ve ever been through a Pacific Northwest winter, you will quickly realize that we are ill-iquipped for the rogue snow storm. A little flurry will send us into a tizzy (which is ironic, because we have them every single year). And a spot of ice? Forget about it, we are boarding up the doors and windows to protect ourselves against The Abominable Snowman and setting our kitchens on fire for warmth. We love winter, but we are not good at winter. We never believe the forecast and we are not prepared. Snow days are the days you eat the last pack of top ramen with stale fruit loops and wonder if this is how it will really end for you. This week we had our first winter storm. I had been home sick with the flu on Wednesday (because this year I am attracting illnesses like a moth to flame). But Thursday morning I was ready to face ‘the big snow day’ as the news was calling it. Schools had made a preemptive strike this year and closed up their shutters before the first flake fell. Which meant that my commute in was glorious and dry. Partway through the morning, tiny flakes began to fall, and I was shocked to see an announcement that the office would be closing at noon. What? Come again? To be clear- we don’t close. Ever. I think in the past ten years we’ve maybe closed one time, and that was for the type of ice storm that left cars looking like pin balls bouncing around the streets of the city. I was planning on staying late to help my boss. But when 12:30 hit, the snow was coming down in sheets and even the most dedicated were ready to hit the road and crawl their way home. I live up on a big hill in the eastern part of town, a place that notoriously catches the brunt of the storms, and so when my coworkers attempted to coax me out the door, I pulled on my long socks, tucked in my scarf and marched out to my car alongside them. In solidarity, you know. On the drive home there were a few cars in the ditch, a few spots where my traction light blinked a warning at me, and one occasion when an oncoming truck wobbled his way into my lane- but eventually, I crawled my way home and parked gratefully in my usual spot. The remainder of the afternoon was spent watching movies in a fuzzy robe while trying to get over the last embers of my flu. Fast forward to this morning: we knew that the world was supposed to freeze overnight, but the news dismissed much of this, saying the roads would start melting at 7, and be freely passable by 10. My first mistake was believing them. You see, while this estimate may have been true in the heart of the city- I lived much farther away- on a side street up a steep hill. The general estimates do not apply to me. I heard my nephews yipping for joy when they got the news that school was cancelled right before I stepped out my front door at 6:30 and clung to the railing- solid ice everywhere. I slid down my driveway to my car and saw the ice castle we were encased in, not to be outdone by the beautiful glisten of the roads. To be more precise- the beautiful glisten of the several inches of ice that blanketed the roads. I pried open my car door and slid inside, and then I sat. How was I going to get out of this without smacking my precious car (a car I still owe a small fortune on) into something much harder and less forgiving than her? No, I could not do that to Ellie (yes, I named my car. I also named all of the potted plants in my office after Wild West characters: Bonnie, Clyde, Calamity Jane, Dinky Dalton and Fifel- I have a thing with naming inanimate objects; and no, that is not strange, that is quirky and charming). So I trudged back inside. And then outside again. And then inside one more time. Huffing, I set my stuff down and reached out to some co-workers who graciously offered to help cover my work assignment that morning until I was able to skate down my hill. Just 30 minutes, I told myself; I would be in my desk before the docket even started. But thirty minutes later nothing had changed. There were still several inches of ice covering the ground, freezing rain pelting me as the wind whipped my hood off my head and the neighborhood children stared at me wide eyes as they tobogganed down their driveways and slid into the cul-de-sac wondering what on earth I could possibly be doing sliding down to my car and scrambling back up the slippery slope, tote bag filled with my lunch and daily supplies slung precariously over my shoulder. No, perhaps a few more hours and then I could make my great escape to the civilized world. Well, it is now almost 4:00 and the ice is still holding firm to its love (the road). That is right, I have been the captive princess of my own little ice castle, restlessly roaming from room to room, stepping outside to check the conditions before dejectedly scurrying back up the driveway (a literal uphill battle all on its own) and texting my co-workers my regular update. We have played real life bumper cars: ice rink edition- when one car slid into my fiance’s, luckily stopping short before hitting my own- and don’t worry, it was a slow slide and the ice encrusting his car blocked any possible damage. We still have not been able to push the offending car away because, alas- no traction. Now, I am a firm believer that you should not stress yourself over things you cannot change. And today I repeatedly stressed myself over the weather and the fact that I was stuck away from my job. But I was also surrounded by family who got sick of my constant worrying and started trying to get my mind off of it. Eventually, I even got sick of myself and I listened. I gleefully got to watch my two nephews and my German Shepard playing in the backyard, all scuttling around trying not to knock each other over on the ice- the dog so frantic to avoid toppling the four year old that he scurried and slid right into the retaining wall. And I also had the satisfying moment when the 7 year old did exactly what I told him not to do: running on ice is not a good idea, and if you don’t listen to your aunt you will slip, you will fall, and then you will continue to slide while staring up at the sky in shock. And then said aunt will try not to laugh too obviously as she walks you back up to the front dooor amidst your most profound wailing (for the record, he was fine- when he realized he wasn’t getting a reaction, the wailing quickly stopped and he was begging to come back outside). I may be an evil aunt at times, but I’m not completely heartless. I got to help the kids hide in my overflowing laundry hamper when the wind and ice were too much to play outside and a game of hide-and-seek was the only way to alleviate the excess energy a snowday provides to small children (and for the record, kids these days are way too easy to find- they will not only hide in the exact same place every time, but they will even ask you for assistance in getting into said location. So hmm- I wonder if you are exactly where I put you ten seconds ago- look, I found you. Oh I’m good). I got to watch a tv show on Netflix. And once I accepted the fact that I wasn’t going to be making it in to the office, I was finally able to enjoy my surprise snow day: something I haven’t had since I was a kid. I will be thankful for my awesome employees who don’t question my work ethic and eventually told me to get over it and be okay with the fact that they had it under control- and stop texting already, you’re making us tense. Getting to work wasn’t worth crashing my car or getting hurt. Next time, I will buy chains and take the forcast seriously. Or I will camp out at my co-worker’s house because she lives where it is flat and typically de-iced. And I know where her house is, so even if she says no, I can sit in my car until she feels guilty and let’s me inside. It’s a win-win, really. But for today, I will try to enjoy a small surprise. I will reign over my ice castle (that does not appear to be melting before nightfall), I will settle in, make a few bags of popcorn and force the nephews to watch Frozen with me- because Olaf is cute and I am an adult so they have to listen to me. And then we can follow that up with some Ant-Man or Hulk, like we did last night. We can turn on our Christmas lights and play a fun little game (but please, no more hide-and-seek, the 7 year old cheats). Tonight I will remember the simple joys you only find when you are trapped in your house for a day. Tonight I will stop acting like such a boring adult bemoaning a missed work day. Instead I will remember the simple childlike excitement that always came with a surprise snow day. I will revel in the magic of the freezing rain and slide down my driveway on my bottom (intentionally this time) just to get a belly laugh out of the baby. Tonight I will be a kid again, if only for a fleeting moment. So cheers, my friends- anyone want to build a snowman?